When I walk past the salsa aisle in the grocery store I give it the Hand. Like a fed-up mother who doesn’t want to hear it. Or a traffic cop halting a lane of approaching cars. Or a dude who knows that store-bought salsa just doesn’t come close to the real thing. Spend five minutes reading this post and your reward is a lifetime of giving the salsa aisle the Hand. Once you perfect the basic formula you’ll never go back to paying five bucks for something that you can do significantly better. Don’t get me wrong, I used to pay that five bucks too, but not anymore. 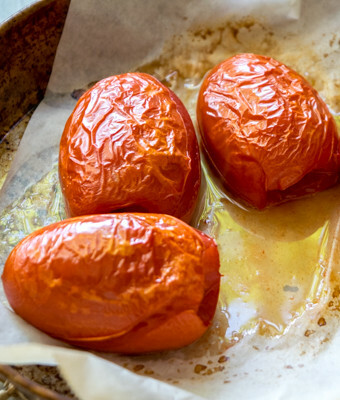 Key #1: Roast those tomatoes! First, you must roast the tomatoes. You have lots of ways to get there. Bake them in the oven at 400F. Toast them on a hot skillet. Put them on a grill. The common denominator is HEAT. 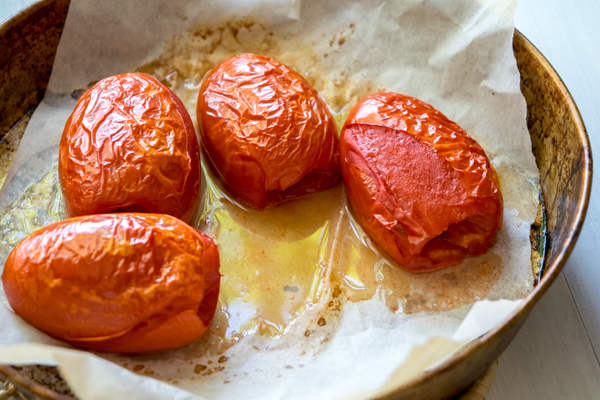 Roasting lowers the acidity of the tomatoes, making them sweeter. It also concentrates the flavor as some of the internal moisture is now evaporated. It’s easier to think in terms of ratios instead of blindly following a recipe. 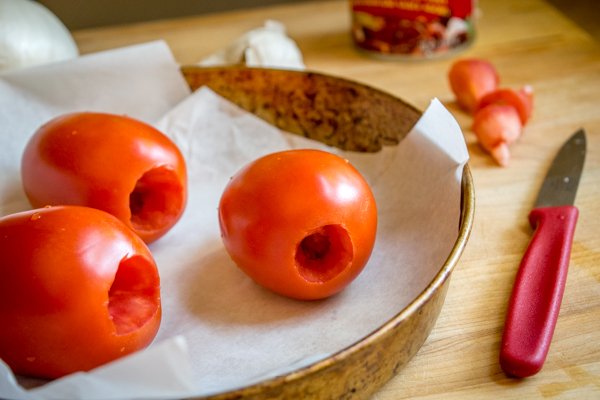 Start by using a 2:1 weight ratio on your Tomatoes VS. Onions for a properly balanced salsa. So if we start with 3 plum tomatoes (300g) then we’ll use ½ of a white onion (150g) to approximate the 2:1 weight ratio. But don’t forget, Mexican cuisine is one of the most forgiving cuisines out there, so there is some wiggle room here if you have to wing it. If you only have regular tomatoes start with 2 tomatoes and half an onion. The final and most important key is what I call Capsaicin Control. See, everyone has their own preferred heat level. Nobody can tell you how much heat you like in your salsa, only you know that. But most salsa recipes don’t take into account the wide range of taste buds out there and they end up defaulting to something that is typically too hot for most people. But what exactly makes a salsa too hot? Capsaicin is the invisible ingredient in chili peppers that gives them their distinctive heat. When a salsa or hot sauce is too ‘hot’ for you it means the capsaicin level is too high for your taste buds. 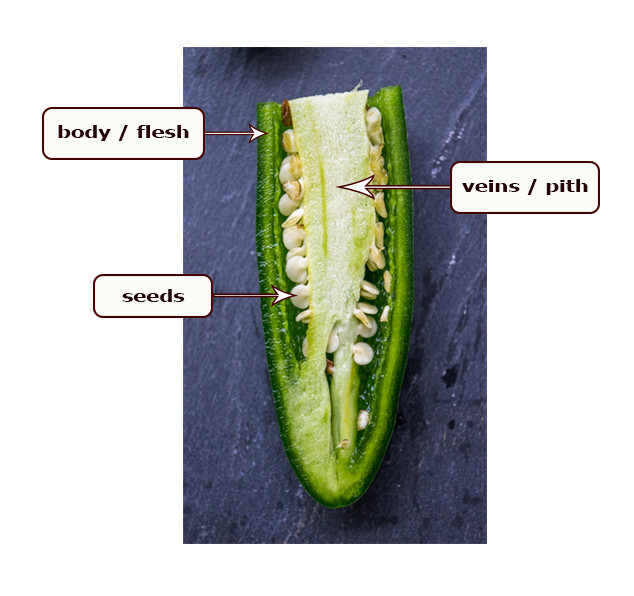 The highest concentrations of capsaicin will reside in the seeds and pith of chili peppers. That’s why in some recipes there will be recommendations to take out the seeds if you want a lighter version. The first few times you make salsa at home you are going to add the capsaicin incrementally, i.e. Capsaicin Control. How? By cutting the jalapeno into quarters and adding one quarter at a time until it tastes ‘right’ to you. That meeting point where the heat of the capsaicin is properly balanced with the flavor of the ingredients is what makes Mexican food taste MEXICAN. Got anything I can taste test? OK, let’s put the 3 Keys into practice. 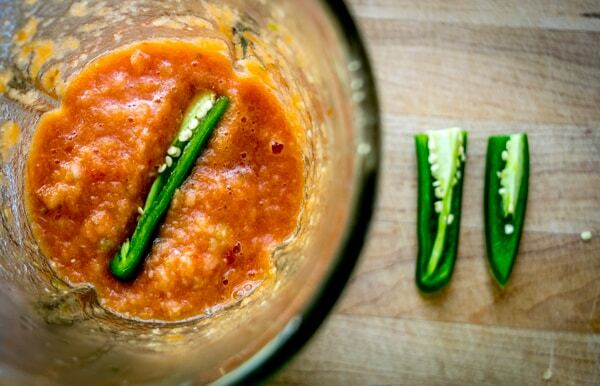 We’re going to focus on the Mother of all Salsas: the lauded Tomato-Jalapeno salsa. Using the 2:1 weight ratio we’ll stick with 3 plum tomatoes and half an onion. Plus we’ll need 1 garlic clove and 1 jalapeno, and salt to taste. Prepare the tomatoes by rinsing and de-stemming. My default roasting method is the oven at 400F. In 20-30 minutes they’ll look like this. 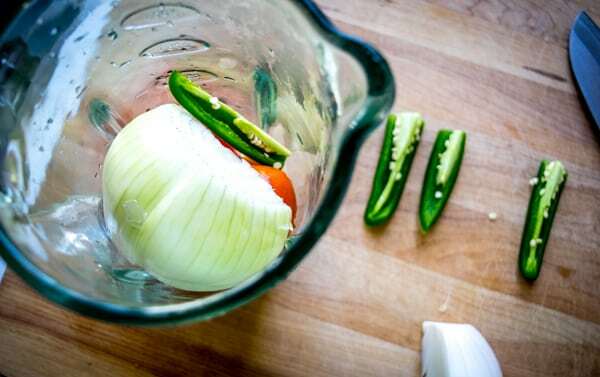 Into the blender they go along with ½ white onion, 1 clove garlic, and only ONE QUARTER of the jalapeno. Pulse blend (so it stays chunky) and taste for heat level. Not enough? Add another quarter of the jalapeno, blend, and give it a taste. Closer? Keep going until it tastes ‘right’ to you. Eventually you’ll get good at knowing where your sweet spot is. For me, I typically add half the jalapeno, taste, and then add another quarter if I need it. You can add salt to taste here but the majority of the time I make this I don’t add salt, it’s usually rich enough for me. This will make approximately 2 cups of the best salsa you’ve ever had. 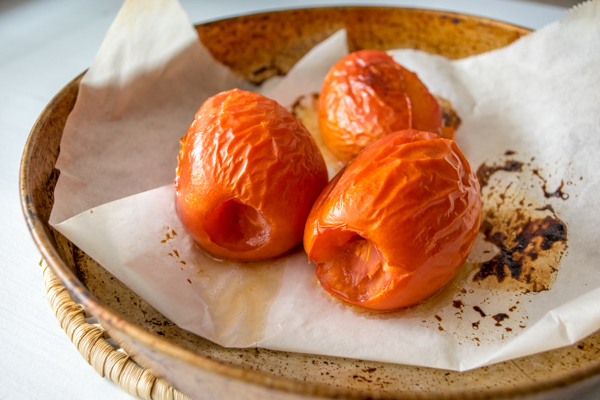 Roasted tomatoes blended with capsaicin moments ago is your new secret weapon. You can always double or triple the core recipe if you want to make bigger batches. It will keep in the fridge for a few days. One other side benefit of roasting the tomatoes is that it makes the salsa warm. You’ll get instant credit for slaving away in the kitchen all day when you present this to your Significant Other. Something about warm salsa generates awe from those of us who grew up eating cold store-bought salsa. Speaking of store-bought salsa…Please say hello to my friend the Hand. P.S. Using these same techniques you can easily make Tomato Chipotle Salsa and a delicious Salsa Verde. No acid besides the tomato in this method? 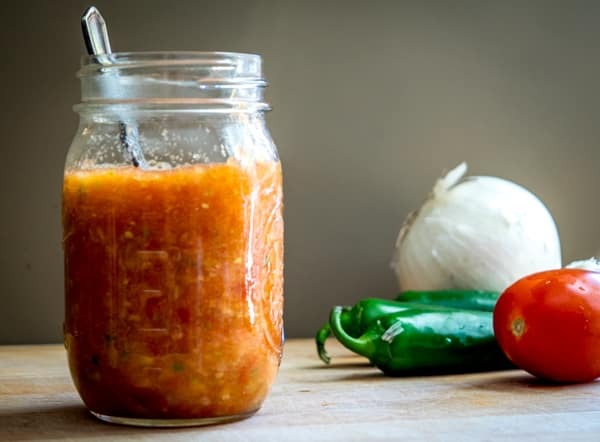 Usually a cooked salsa will have the onions and tomatoes roasted and or charred along with the garlic to enhance the depth and richness of the salsa. I’m surprised you didn’t add any salt, lemon or lime to the end result as well. Then put them on the side so that people like me that do enjoy a “finished” more varied flavor spectrum can dial it in. good methodology though! I enjoyed reading this! Quite interesting and useful. Bookmarking this one, will need these tips for myself later. If 100g = 3.5 oz, then 300g = 10.5 oz. Hey thanks much for catching this! Just corrected it. Cheers. Hey Glen, yeah you got it those are the correct ratios. Keep in mind that you’ll get approx. 2 cups from a batch that uses 3 tomatoes as shown in this post, so quadrupling it will give you around 8 cups or so. Cheers. Tried your method (portions) blind, but we also added our favorites.. a little lime juice and a little vinegar. We wont blame you if it’s too acidic. Thanks for your post. Thanks Dawn! Hope it treats you well! I think that it would be good to put the onion, garlic, and jalapeno in the oven as well – bake the whole thing for 20 minutes and then blend. I appreciate your two-to-one ratio for the tomato and onion. I happen to like some cilantro and lime/lemon in my salsa as well, but that’s just personal taste. Thanks Ben this is a good tip to keep in mind. Cheers. I’m going to use your recipe as a base and add cilantro, grilled corn, lime juice, cumin, diced raw red onions, diced raw red peppers, and scallions. It’s for a salsa contest. I’ll tell you-all how it did . Nice, sounds awesome…good luck Jose!